Approach Independence Mall and the Liberty Bell and you will see Philadelphia’s new National Museum of American Jewish History (a Smithsonian affiliate) looming straight ahead. 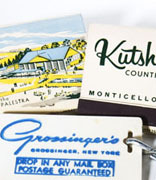 The museum tells another American independence story – this one through Jewish eyes. In a city rich with tales of quests for a variety of different freedoms, the first Jewish American community was founded in 1740. So, some might say that this museum is a very long time in coming. I recently had the opportunity to take a sneak peek before the official opening in late November. The building itself is a marvel. From the moment you enter the 85-foot-high atrium you follow a flow of interlocking staircases to exhibits that combine religious, cultural, historical and political stories. Two sculptures representing the past and the future: Religious Liberty (created in the 19th century) and Beacon (commissioned for the museum) stand to welcome visitors. While most other Jewish museums focus on immigration and the Holocaust, the NMAJH has created a portal into the lives of American Jews like myself, my parents and my grandparents. The museum presents something for everyone to enjoy and ponder. Families can explore the story of the Brooks family, real pioneers who headed west in a covered wagon to build a new homeland. While listening to a soundtrack detail life on the trail, children can play with items that were typically taken on the journey. There are also model tenement apartments where young visitors can try on period clothing and set the Sabbath table. The depiction of how a sweatshop would have produced clothing in the early 20th century—using actual equipment from the period—was sobering as it reminded us of a grittier path some traveled just a couple of generations ago. 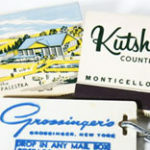 Jewish summer camps, suburban kitchens with typical foods, Bar Mitzvah celebrations and the ubiquitous Jewish-American experience, the Catskill mountain hotels, are displayed in interactive settings, photos and film. 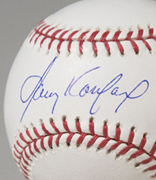 A baseball autographed by Sandy Koufax. For me, the highlight of the museum was the Only in America Hall of Fame. Here, 18 individuals, among them Sandy Koufax, Jonas Salk, Leonard Bernstein, Steven Spielberg and Barbra Streisand, are celebrated with artifacts including Emma Lazarus’ manuscript of “The New Colossus” and Irving Berlin’s piano. These special lives and accomplishments are told in major film productions, testimonials and databases. This cornerstone gallery will continue to grow as new inductees are added. Look for me on my return visit…I’ll be the one gawking at Barbra Streisand’s costumes.